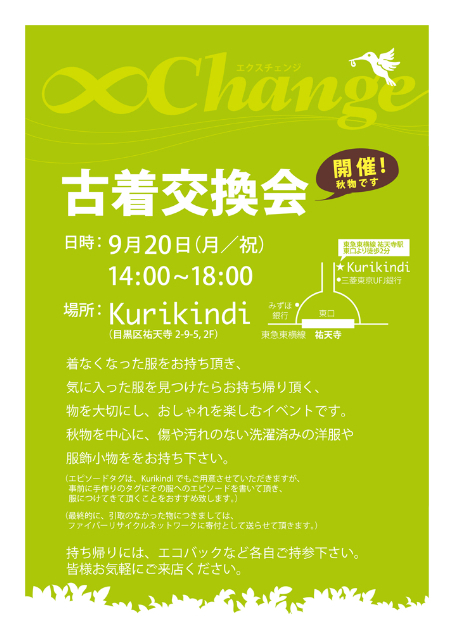 In July, I held my first xChange clothing exchange party at Kurikindi. People bring clothes that they no longer wear and take home with them clothes that catch their eye. It is an event where clothes don’t go to waste and people can enjoy finding themselves some “new” clothes. This coming event will be for autumn fashions. Please bring clean, laundered, undamaged clothes, hats and accessories to Kurikindi on the day. Everybody, please bring your own bag with you to take the things that you like back home in. I shall donate any leftover clothes to the Fiber Recycle Network. I hope that you can come to the xChange event. I know it is still hot at the moment but it is September, which is actually autumn, so I’d like you to bring along autumn clothes this time for this event. The salon is quite small, so if it gets crowded, we may have to limit the number of people inside. I hope you can understand why this may be necessary and I also hope that nobody will find it too much of an inconvenience. Last there was no space to sit and write out Episode tags because the salon was so crowded, which was a bit of a nuisance. This time, so that things run a bit more smoothly, I recommend that you write out and attach Episode tags to your clothes at home before coming to the event. 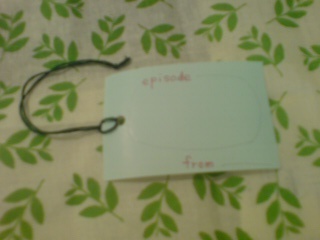 The Episode tags that we have at Kurindi look something like this. Please attach a tag to the item of clothing with something written on it related to it, e.g., a memory associated with the item, how to look after the item, or advice on wearing the item to its best advantage. And please write your name, initials, or nickname on the tag. Please feel free to come by the salon and pick up some tags before the event if you want to. After the event, I will count the tags so that I know how many exchanges there were. Then, I’ll post the number on my blog. I really hope people who live in and around Yutenji will come to this event. I hope to see you at Kurikindi.